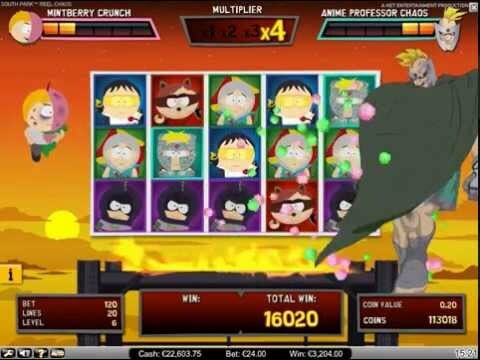 Prepare for trouble because the crude and crazy boys from South Park are back in their second online slot. Brought to you by NetEnt, South Park: Reel Chaos features your favourite kids, Kyle, Stan, Kenny and Cartman. Now with superpowers, Kyle, Stan, Kenny and Cartman take on evil villains. With names like General Disarray, Evil Minions and Professor Chaos this 5-reel, 3-row slot is bound to be nothing short of awesome. Spin and fight the evil villains using each of the character’s own unique superpowers. Plus you’ll get to play the 4 mini games that lead to an ultimate showdown bonus round. There’s no doubt that this game is part of the South Park universe with graphics, animations and sound effects that will make you think of the original TV series. Features like Cartman’s wild symbols and the potential 650,000 coin win make this game even more appealing!